We serve a diverse population of clients from across Lake County and beyond. In 2018 our top client hometowns were Libertyville, Mundelein, Round Lake, Waukegan, and Grayslake. Our clients came from 29 Lake County zipcodes, plus McHenry, Cook, and DuPage counties as well as Wisconsin. 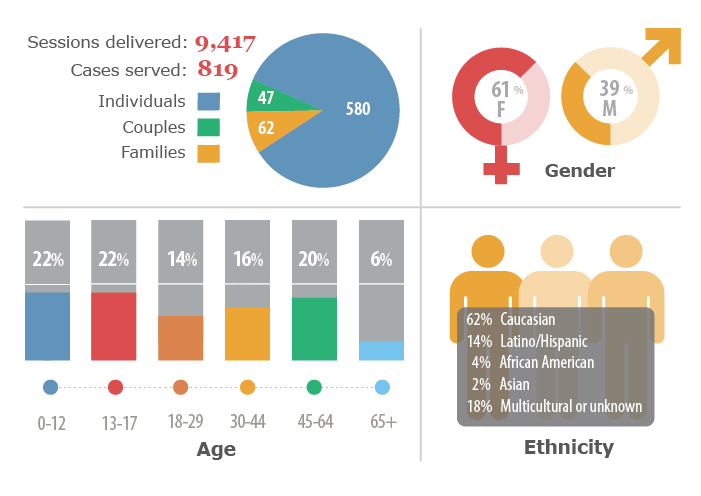 The figures below give a snapshot of our clients. Youth & Family Counseling strives to improve access to care by identifying and reducing barriers that stand in the way. Transportation barriers: We bring our services to underserved parts of Lake County by partnering with organizations located in those communities. Our therapists deliver counseling and/or support groups at Erie HealthReach in Waukegan, the Waukegan Public Library, Nicasa in Round Lake, and Mundelein High School. Language barriers: We deliver counseling in Spanish as well as English to serve Lake County's growing Hispanic population. YFC has four therapists who are fluent in both English and Spanish. Financial barriers: We still provide our sliding scale fee subsidies to people who are low-income and uninsured or underinsured. We are also in-network with most Illinois insurance plans, including Medicaid managed care plans, which few providers accept. ​* Co-location sites include Erie HealthReach Waukegan Medical Center, Waukegan Public Library, Nicasa in Round Lake, and Mundelein High School.